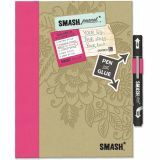 SMASH Folio 10.25"X7.75" - K&COMPANY-Smash Folio: Pretty Pink. Your Pretty Pink SMASH Folio with embossed chipboard cover stores all of your favorite things in ultra-girly fashion. But these aren't just your ordinary journal pages, they're covered with romantic imagery and you're a lady captions to make designing a snap. This package includes one 10-1/4x7-3/4x 1 inch folio with forty pages and glue/pen stick combo. Imported.